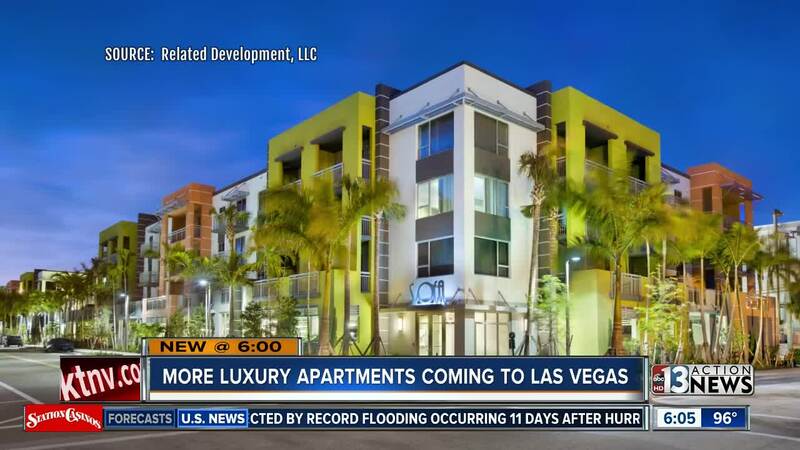 Three more luxury apartment complexes are coming to Las Vegas. This time, the developer is from Miami. Miami-based luxury apartment developer, Related Development, picked Las Vegas because of our rent growth. President of Related Development, Steve Patterson, says Las Vegas ranks near the top nationally for rent growth and we are the perfect place for new construction. "We can't wait to start on our first project and we want everybody in the valley to know that we are here to stay," said Patterson. "This is not a short term commitment. We plan to be in Las Vegas for decades to come." Patterson says we can expect the three complexes to be along the 215 beltway and/or in the southwest valley. They plan to invest upwards of $300-million and create 350 jobs. The complexes will bring more than 1,000 units for rent. Patterson says a two-bedroom will cost anywhere from $1,400 to $2,000. The properties will be high end with resort-style pools, top notch fitness rooms, and special add ons like virtual reality rooms. Patterson hopes to have the projects underway by 2019. We also recently told you about the new luxury apartment complex, Lotus, outside of Chinatown as well as Fremont9 in downtown Las Vegas.